A 6 watt audio amplifier circuit using TDA2613 is shown here. TDA2613 is an integrated Hi-FiÂ audio amplifier IC from Philips Semiconductors. The IC is switch ON / switch OFF click proof, short circuit proof, thermally protected and is available in 9 pin single in line plastic package. 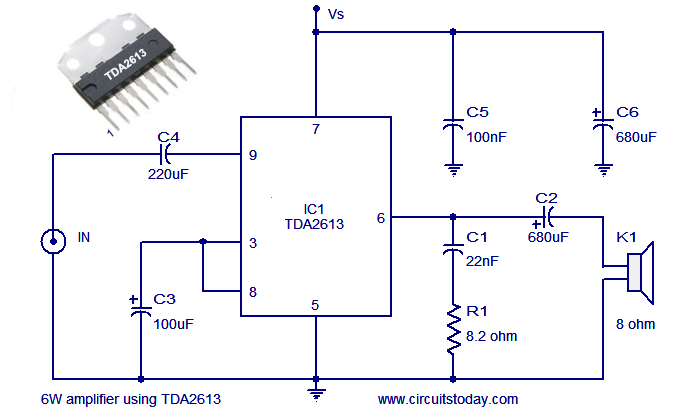 In the given circuit, TDA2613 is wired to operate from a single supply. Capacitor C4 is the input DC decoupler while capacitors C5, C6 are power supply filters. Input audio is fed to the non inverting input through capacitor C4. Inverting input and Vp/2 pins of the IC are tied together and connected to ground through capacitor C3. Capacitor C2 couples the speaker to the ICs output and the network comprising of capacitor C1 and resistor R1 improves the high frequency stability. Circuit diagram of 6 watt amplifier using TDA2613. Supply voltage (Vs) can be anything between 15 to 24V DC. Heat sink is necessary for TDA2613. Do not give more than 24V to TDA2613. plz wat z dat IN? iz zit d input? Input capacitors cannot be so high as input impedance is normally high. it should be 220nF. You have a mistake on shema, the correct value for C4 is 220nf and not 220Âµf. as mentioned on constructor datasheet. can’t i give a supply of less than 12 volt supply? well am impressed with the tda 2613 amp! Hi Mike very low distortion & noise very low volume to 6watts. good Hi Fi amp you have to listen to believe. how is d performance of this 6watts hi fi ampli?